soustitreCome and visit Provence and its most stunning landscapes in France ! Under the warm sun, Provence & Côte d'Azur offer a splendid diversity of countryside: the perched medieval villages, the vast lavender fields, the wineries of Chateauneuf du Pape, the massive Pont du Gard aqueduct, olive orchards, the coastline of Porquerolles island. Cycling in Provence and going on a walking tours of Provence are by far the best way to discover Provence natural surroundings, Provençal local culture, and meet its people. It is rare to find a place that marries so many riches: beautiful landscapes of Van Gogh Provence, exceptionnal villages of the Luberon, welcoming and charming accommodation, and the unbeatable Provençal way of life with its famous local markets. All for the pleasure of those who come to explore. 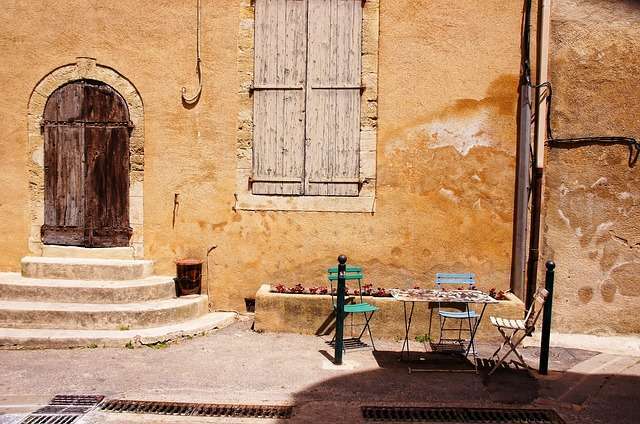 All of this is laced with a vast network of Provence hiking trails and quiet country roads that have made Provence a paradise for both walking tours and cycling holiday in France. The plains and hills are rich with Roman monuments and medieval monasteries such as the Senanque abbey, the old cities – such as Avignon, Nice – bustling with activity, nightlife, and culture. Come and explore Provence : take part in strong traditions past and present, stroll through narrow cobblestone streets and colourful markets, savour its famously delicious Provençal cuisine. Here is a map of our beautiful region which will give you an idea of ​​the places to visit first during your stay. Aix-en-Provence: walk in the capital of Provence! Bonnieux: Luberon and lavender walks and rides ! Camargue : hike or bike between flamingoes, wild horses of Camargue and black bulls! Marseille city centre : walk on the famous "Vieux Port"
Saint Tropez: walk in an iconic French Riviera village! Sault: cycle and walk in the lavender fields of Provence!